As most bloggers do, I love to read other’s blogs and drool over the photos and recipes. If I had time to bake everyday I’d have no problem with the growing list of recipes I’ve accumulated over the last year or so. But life gets in the way of baking and the list grows and grows. Last week I saw a recipe on Brilynn’s blog, Jumbo Empanadas, that she made for the Foodtv.ca Cooking Club and I just couldn’t resist adding it to the list. 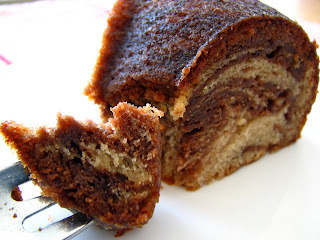 I had a little time on my hands, on Easter Sunday, and I decided to bake the Light Swirl Coffee Cake from Brilynn’s blog. First I had to make apple butter though as it was one of the ingredients of the cake. So I made like 2 cups of apple butter to use 3 tbsp in a cake recipe! Yes I know, I’m obsessed, I have been called that before, I’m used to it. But if you make that apple butter, you’ll see it was worth it! Eat-it-by-the-spoonful worth it, tell-yourself-it's-healthy-because-it's-made-with-apples worth it. Of the 2 cups I made, I gave a small jar to a friend and there is only a small jar left. Oh yes, it's very, very good. Now back to the cake, I’m not sure the 3 tbsp of apple butter it contains make much of a difference in the taste of the cake but that is one moist and delightful coffee cake! It was my first time baking a marbled cake and I’m really happy with the way it turned out. When I first saw the recipe, it was the cake that drew my attention, but in the end the apple butter was just as incredible as the cake. Two keeper recipes in one, unexpected is good. Preheat oven to 350 degrees F. Butter and flour a bundt or tube pan. Tap away excess flour. Set aside. In the bowl of a mixer fitted with a paddle attachment, sift together flour, baking powder, baking soda, salt, and cinnamon. Stir in sugar. Add the soft butter and ½ the yogurt and mix on low speed for about 2 minutes, just until mixture starts to come together. In a medium bowl, whisk together the eggs, vanilla, lemon juice, apple butter and rest of yogurt. Add this mixture to the flour mixture in three batches, beating in between additions. Scrape down the sides and beat for 1 minute on medium speed, until batter is smooth. Transfer half the batter to another small bowl. Add the cocoa powder to one batch and stir with rubber spatula to combine thoroughly. 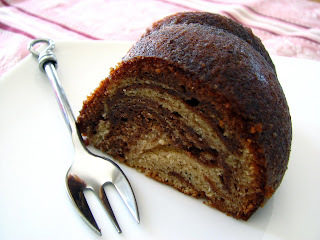 Pour chocolate batter carefully into other half and fold just twice to create swirl. Pour batter into prepared pan, gently. Bake on the middle rack of oven for 45 to 55 minutes. Cake is done when a knife inserted in the center comes out clean and top is golden. Leave cake in pan and cool on a wire rack for 20 minutes. Meanwhile, make glaze by combining all ingredients in small saucepan, until it comes to a boil. Remove cake from pan, flip upside down and drizzle with glaze. Cool completely. Place all ingredients into a large saucepan and cook over medium-high heat until apples break down and become very soft. Continue to reduce until 80% of the liquid has evaporated and the sauce is very thick and dark brown. Puree with an immersion blender, a standard blender or in a food processor. Sieve to remove any remaining pieces of apple peels. Here’s something else I hadn’t expected, a few weeks ago, Lynn of the famed Cookie Baker Lynn blog, surprised the heck out of me by awarding this little blog an E for Excellence. Thank you so much Lynn, it makes me very happy to know that my photography and recipes are being enjoyed! And Kristen of Dine and Dish who inspires me by the quality of her photography and writings. I always look forward to new posts from these guys as they always contribute to my growing list of recipes to try! Thank you for the award and for the kind words - they mean the world to me! It's going on my ever-growing list as well! No wonder you couldn't resist making these - they look, and sound delicious! 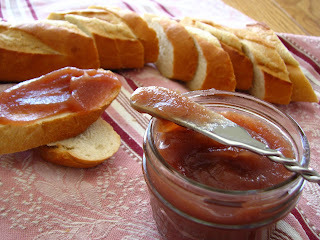 I LOVE apple butter, but have never made it myself. Like you, I have an ever-expanding list of recipes to make due to all of my reading of other blogs! This one may get made in the fall when apple picking season is upon us! Yum! Thank you so much for the award, you really made my day! I've not had apple butter before, but will save this for when we get our apples later in the year. I am like you, I have a list with a couple of hundred recipes - it doesn't seem to be going down though. OH NO - it just got longer and I'm blaming this coffee cake!! Your cake looks awesome, I'll definitely have to try making the apple butter. Both the coffee cake and the apple butter look so good! I was/am planning on making both this weekend for the Foodtv.ca Cooking Club. Lovely cake! Brilynn always has great stuff on her blog. I also have to add this cake to my list. Maybe Mother's Day? Totally off-topic, except it's made with Nutella which I can also eat by the spoonful, but I just tried the Oven Baked Crespella recipe out of this month's Gourmet...and it's about the easiest yummiest thing ever! Patricia - You're welcome, it's well deserved! Kimberleyblue - If only we could bake every single day! Alfie - So, so delicious! Appltart - Good question... The original recipe doesn't say but I've seen other recipes that say "refrigerate for up to 2 months". I'm sure it won't last that long in my refrigerator, but you could always halve the recipe. 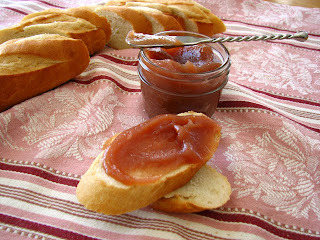 Patsyk - This apple butter would be a great way to use freshly picked apples! Amy - Thank you! I love trying new recipes that become keepers. Brilynn - You're very welcome, and thank you for posting such great recipes! The apple butter is definitely worth a try, really not much work involved for such a treat! Kevin - I can't wait to see your take on it! BiscuitPusher - I just got that book, yay! I will have to try that bundt cake.